Minimum Order Quantity 10 Nos. Standard Packing Wrapped with polythene bag and packaged in 3 ply corrugated box. Premium Packing Wrapped with polythene bubble bag and packaged in 3/5 ply corrugated box. Customised Items may attract variation in rates and lead time for delivery. We "Skymark Impex (india) Pvt Ltd.", established in 2012 are serving our customers by manufacturing, wholesaling, exporting and supplying a high-quality Box and Bajot. 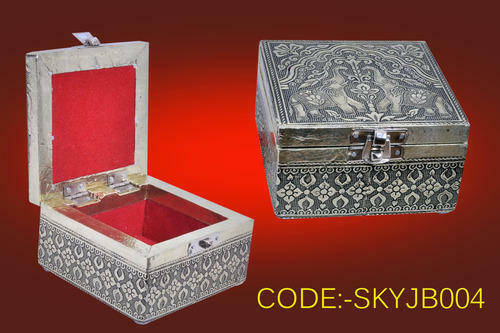 Offered range consists of Jewelry Box, Wooden Dry Fruit Box and Dry Fruit Box. Production materials for these products are provided by the certified vendors of the industry. The product range offered by us is highly appreciated by our clients for their crack resistance, light weight, easy to use and long service life features. Apart from this, these offered ranges are used in the various fields to pack the products. We export in US, UK, Canada and UAE. To design the offered products as per the set industry guidelines, we have developed sophisticated infrastructure facility. Our professionals selected through industry approved selection procedures. Further, for hassle-free execution of all our business related tasks, we have segmented our infrastructure facility into many operating units. Also, our stringent testing criteria ensure that we produce the best quality dry fruit box & jewelry box that make working a pleasure. Our experienced personnel maintain the entire product range in a systematic manner. We are able to deliver all the offered products on time, as we have developed a wide distribution network.